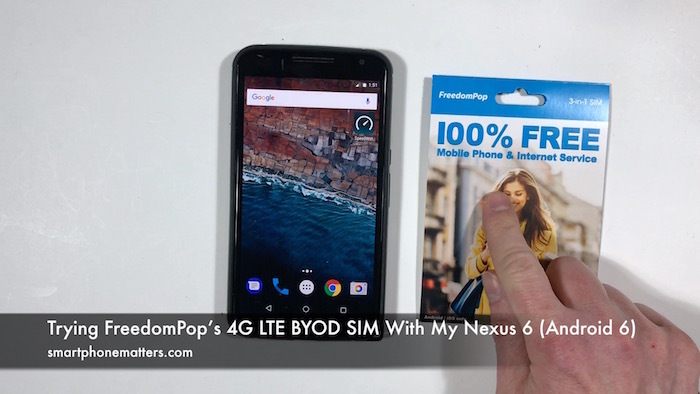 I recently tried my FreedomPop 4G LTE BYOD SIM kit with my Google Nexus 6. My Google Nexus 6 is still using Android 6. The steps may be different depending on what brand phone and Android version you have. Once I put my FreedomPop SIM in the Nexus 6 I had to wait a few minutes for it to get an HSPA connection. My phone did not immediately connect to the 4G LTE network. I have noticed that sometimes you need to wait a little while for a new SIM to connect to the 4G LTE network and it did later. I immediately tried using Chrome to visit smartphonematter.com to see if my cellular data connection worked but it did not. Some wireless services automatically set up the phone for data when you put the SIM in while for others you need to do it manually. For FreedomPop, I had to set up the APN manually, and to be fair, this was clearly explained in the instructions on the back of the SIM kit. Once I set the APN to fp.com.attz, I was able to go back and use Chrome to browse through smartphonematters.com. Now, read this section carefully. This is important. If you want to use FreedomPop with your Android phone, you’ll need the FreedomPop Messaging app to make and receive phone calls, send and receive text messages (SMS), send and receive picture messages, as well as group texts (MMS). You cannot use the built-in or your default apps. I tried using the built-in dialer to make a call but the call doesn’t go through. I just heard one of those “We’re sorry..” messages that phone companies are known for. I was unable to send and receive text and picture messages using Google Messenger, which is the default message app on my Nexus 6. The instructions on the FreedomPop SIM kit said I needed to install the FreedomPop Messaging app from the Google Play store. When I looked there I found seven different FreedomPop apps. I installed FreedomPop Messaging, MyFreedomPop, and FreedomPop Visual Voicemail, but not did not look at the other four apps. Once I installed the FreedomPop app, I was able to make and receive phone calls. One nice feature was that the FreedomPop app automatically opened up to dial the call when I placed a call from the phone app. When I look at it closely it looks like the default dialer first opens but then closes and the FreedomPop app dials the call. When I called my Nexus 6 with FreedomPop from my other phone, I declined the call. I was able to leave a voicemail message and then listened to the message on my Nexus 6 using thr FreedomPop Voicemail app. It’s a little hard to tell what is a free or premium feature with this FreedomPop trial but I think the Visual Voicemail is a service you need to pay for monthly. I was also able to send and receive SMS text messages using the FreedomPop app. When I installed the FreedomPop app it prompted my to make it the default app for SMS, so I did. After that I could use the FreedomPop app to send and recceive SMS text messages. I was also able to send and receive MMS picture messages using the FreedomPop app. One thing I noticed was that I didn’t see a way to use the camera directly in the Messaging app for picture messages. Maybe I just missed it. Finally, I tried the My FreedomPop account app. You can use this app to manage your FreedomPop account, check you data usage, and order new services. I earned 200MB of data for free by installing the app. I think the Android version of the app looks more polished than the iOS version. I didn’t see as many tabs or pages in this app, including the ones to earn data. I was able to set up FreedomPop on my Nexus 6 without issues. The service works and integrates well with Android. You will need to decide if using the FreedomPop app for calls and messaging is right for you though. For this article, I just wanted to set up my Nexus 6 with FreedomPop and try out the features. In a future article, I’ll share my thoughts and a summary about my FreedomPop experience.